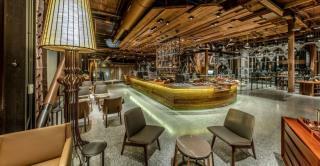 (Newser) – Starbucks may be heading "home" to Italy, but its largest store ever will be stateside. The coffee company is planning a 20,000-square-foot location in Manhattan dubbed the Starbucks Reserve Roastery and Tasting Room, per the Seattle Times. CEO Howard Schultz describes it as "the Willy Wonka of coffee," per CNNMoney. Housed in a nine-story office building, the location—part roasting facility, part cafe—will be based on the Starbucks Roastery that opened in Seattle in 2014. The doors are set to open in 2018. Next on Newser: Winner of Panama Papers Scandal: Bernie Sanders? It is actually possible to walk in and have a house blend and only pay $2, I do it all the time. Or My favorite is actually a hot chocolate and 2 shots of espresso, bam another $2. It's really not that expensive. The wife and I also buy bags of coffee from there too. But if people are going to complain about the price of a drink that takes the barista ten minutes to make, your out of touch with reality. Whoever owns the property will make the big bucks on this deal. Always! A order at this new STARBUCKS! Customer: I'll have a GRANDE mocha Twist with a little bit of honey! Starbucks counter person: That will be $20.75 Please! Customer: WTF! I will go to 7-11 for some coffee now! There ya go ALL! !